Horse trauma is much more wide-spread than we realised when we first started working with difficult and dangerous horses. Understanding why is essential for both addressing and avoiding this problem. The possibility of traumatisation in horses explains a lot of things. The deeper we go into resolving the seemingly divergent issues our horses have, the more they all seem to relate to traumatisation. Horse trauma is the key which makes sense of these horses' reactions to their external and internal world. Not only does its existence explain why problems arise so apparently easily, but understanding how it works is giving us solutions we hadn't been able to find before. Distraction and anxiety when working in the arena or out on a hack. Refusal to accept the saddle or other tack. Extreme sensitivity to grooming or specific tools. Stable vices such as box-walking, cribbing/wind-sucking, and weaving. Persistent reluctance to lead and/or go into a trailer. 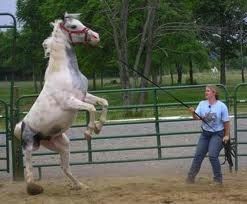 Horse trauma is the result of exposing a horse to an experience which is traumatic for them. 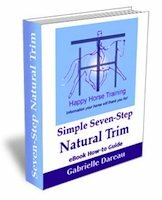 It can be traumatic because it is repetitive, as in the case of continuous use of ill-fitting tack, or because one particular experience is so frightening for that horse. Horses can be traumatised by events we don't consider to be challenging. Common severely traumatising experiences are forced weaning, rushed backing and riding, and aggressive treatment during shoeing procedures. If a horse is no longer in a traumatic situation but continues to react negatively, this can be horse trauma. 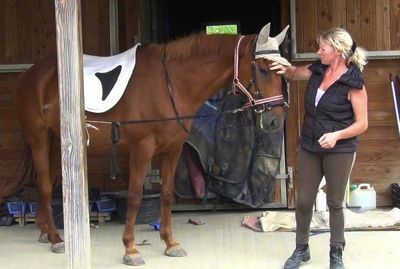 A common example of this, discussed below, is saddling up a horse when you are as certain as you can be that it fits and doesn't cause pain, but the horse continues to react evasively. 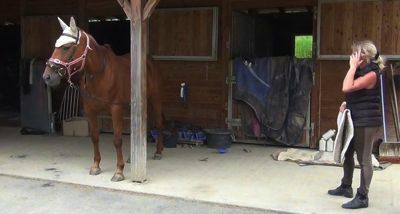 Horse trauma and a horse in pain are difficult to distinguish, and may both be present. Fortunately it isn't particularly important to know exactly what is going on, only to know how to react to whatever behavior your horse presents. This way you will always be having a healing influence and bringing your horse into the present moment. To understand horse trauma it helps to appreciate fully what it means that a horse is a prey animal (see Horse Behavior: what it means to be a prey animal). Of course it is a reasonable assumption that any animal with a complex enough central nervous system can be traumatised, and humans are particularly prone to it because we have lost much of the social structures which help us to cope with traumatic events without repercussions in the future. Being a prey animal, as horses are, does make them more vulnerable because prey animals are only ever attacked, and are therefore more specialised in the way they deal with perpetual threat. Being more specialised means that they are less adaptable to new environments. An example of this is a comparison between horses and dogs. Dogs are carnivorous with some omnivore characteristics, so they are less specialized than horses who are herbivores only. Dogs have adapted to our world phenomenally well. Of course there is the whole question of selective breeding, and the fact that dogs have been selected to get on with humans, but horses have as well, and both species has been bred for 'improved' (i.e. easier for humans to communicate with) temperament and conformation. It could be said that horses also have adapted remarkably well to our world, to domestication, but this is where it becomes more complicated, perhaps we assume they have adapted when in fact they have often simply 'tuned out' or dissociated. Horses in the wild are similar to other prey animals in that they evaluate threat, and they then either react to it or not, then resolve the physical and emotional after effects (residual shock energy). They do this all day, every day, and horse trauma does not result. Predators in general do not live under the same level of perpetual threat, and the need to find food and shelter and reproduce is common to all wild animals. Maybe it is a little bit of compensation for this heavy load, as well as being an evolutionary advantage, but horses seem to be able to 'dissociate' exceptionally easily. Dissociation can be described as the mind leaving the body. It can be as subtle as thinking about somewhere far away from where you physically are, or in the most severe case, the mouse frozen in shock when being played with by a cat. In the case of the mouse, the central nervous system has been in overdrive, firstly by charging up the fight/flight reaction (sympathetic nervous system), and then when hope seemed lost, by firing up the 'freeze' reaction (parasympathetic nervous reaction) at the same time, so that the mouse becomes anaesthetised to the horror of the experience and the possibility of death. 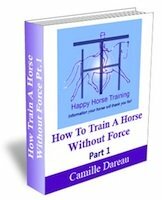 There is a more comprehensive explanation of the body's response to traumatic events in the free horse trauma supplement which comes with the HHT ebook How To Train A Horse Without Force Part 1. Whether or not there is a spectrum of severity of trauma, or the different forms of dissociation are connected in some other way is not fully understood yet, the principle is the same. If you can't deal with the present moment, either physically or emotionally, you 'leave'. People do this all the time of course, we call it distraction or escapism, we read books and watch films and most of us are rarely fully in the present moment. The difference between us and horses though, is that horses have not developed their intellectual mind over thousands of years as we have. They don't think rational thoughts like us. This means that when they dissociate it isn't like our human habit which is a kind of stepping stone on our way to higher human consciousness (an excellent book on this subject is The Power of Now by Eckhart Tolle). Horses dissociate because they have been traumatised as a result of human intervention. In the wild horses may live through traumatic events frequently, but they don't become traumatised. Horse trauma is something we are responsible for, and it comes up so often because we have taken these prey animals out of the environment they are adapted to, often misunderstanding their basic needs and behavior. Dissociation is not the only symptom of horse trauma, but it is arguably the least obvious. Other symptoms include stressed behavior, physical illness and aggression. The fact that it is easy to ignore one of the most common symptoms of horse trauma makes it easier for us to carry on regardless. After all, if we want to exploit horses we are not going to go looking for problems. 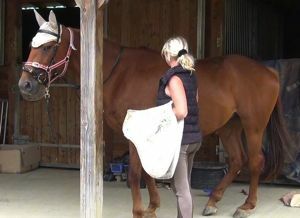 This is why it is only the people who are truly looking for a more meaningful connection with their horse, or who want to solve their horse problem in a compassionate way, who will be interested in seeing the truth and will join the holistic horse revolution. 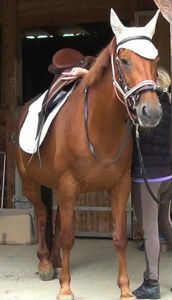 The mutual concentration and physical/energetic connection between a horse and rider can be one of the most powerful ways of being present and healing horse trauma. This happens when the horse's boundaries are respected, and both horse and rider are in a relaxed and attentive state of mind. Riding school horses are well known to be 'switched off' and 'tuned out', and they certainly dissociate for much of the time depending on their lives. Dissociation is often the 'last resort' of a horse being traumatised by a situation. It is when they appear to finally give in and accept what is being asked of them, when they stop fighting or submit. Unfortunately although we tend to believe we have succeeded in our goal, in reality we have pushed our horse further away from us. Horses are not just a body made of flesh and blood, it is their spirit, their personality which attracts us in the first place. Their 'being-ness'. Sadly we often shut that down and turn them into flesh and blood only in order to achieve our ends. 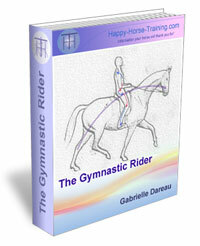 How can you tell if you are crossing the line, or if your horse has 'left' you? The only sure way we have found is whether you can sense your horse's personality coming out more each time you work with him, or less. Of course it is difficult to make a concrete rule out of something which is not concrete. Even finding photographs to illustrate these things in the 'energy dimension' is not straightforward. A relaxed horse can look very similar to a dissociated horse. A tense horse may just be exhibiting tension, not necessarily expressing trauma symptoms. This is why it takes a bit of time to get to know a particular horse and how they express themselves. 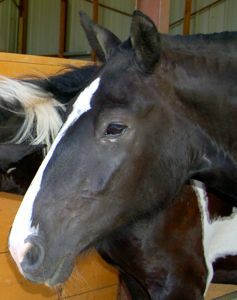 Some horses are prone to dissociating and their life may be traumatic for them where another horse would sail through. Like any skill though, the more you practice 'reading' the horses you come into contact with, as well as your own reactions to them, the more you will understand. Amy (left) has been with us since she was six months old. She did have a forced weaning which certainly has not helped, but she is nevertheless a naturally dreamy type of horse and she dissociates at the drop of a hat. Any interaction with people is a challenge for her. She also has physical issues which are probably a reflection of her emotional one, and they make her training harder for her. It is easy to tell that she is dissociating (and not simply relaxed most of the time) because her tolerance of demands is very low and she can switch from dreamy to dangerous in a very short time. Working with her involves a lot of careful attention to her needs and gradually she is becoming more present and reliable. The safe feeling some horses give a rider is not just luck, it is the presence of that horse's intelligence and acceptance and can be achieved with patience. This young horse, Uno (right), is an interesting case because we have owned him since he was born, and we always took his complete trust in us as a given. However, at a certain stage in his training - during the lunging work in preparation for starting to ride him - he started to express a lot of tension in his work, bolting uncontrollably at the slightest opportunity, with no warning and no apparent reason, even though he had got to an advanced stage in his lunging work before this behavior developed. It became clear that Uno had a lot of anxiety about working at the arena which had been hidden until this point by his otherwise extremely dominant nature. We concluded this unexpected anxiety to be due to a combination of an underlying nervous temperament, his strong bond with the other members of his herd (including his full sister who he has grown up with) which he had to be separated from during his work, and a probable loss in trust of humans as a result of an unavoidably abrupt weaning from his mother. There were also physical issues to do with his growth that were making him feel uncomfortable in his body. The solution in Uno’s case was to go right back to the most basic leading work in the arena, and go through a long process of making him become 'present' again in this situation, i.e. enabling him to let go of the anxiety that had become associated with his training. This involved constant allowing of threat assessment (as described on the page Horse Behavior), combined with re-establishing the boundaries which he had been pushing through, in a non-aggressive but deliberate way. When he became present through developing trust and respect for his handler as his leader, the difference in his whole energy was tangible, and his training was able to proceed. 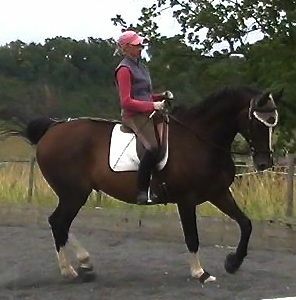 Usually triggers are fairly straightforward with horses as they make associations very easily and directly. When the traumatic event may have happened is less easy to interpret however as horse trauma can lie dormant for some time and seem to appear out of nowhere. As many horses are bought and sold so often in their lifetimes their histories get forgotten and often it is not clear when they were traumatised by handling or training experiences, especially early ones. 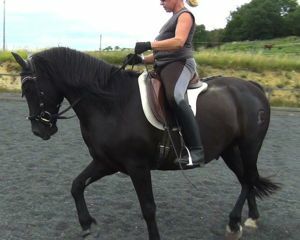 The mare in the following example has multiple traumatic associations, most of them to do with being ridden. Over her healing and training process we have addressed them as it felt right to at the time and the journey seems to have been coming further back to the source all the time. Originally we worked with hacking out, which was her deepest fear, then the different anxieties she had about being ridden in general. As her process has been unwinding over many years now, and our understanding of what we do with the horses has evolved, the concept of horse trauma has become clearer and the possibilities have opened up. Hope has always been grumpy and reactive about her saddle, but as she was like that from before - and her present saddle is a beautiful fit - it was only relatively recently that I realised dealing with her saddle trauma was the next part of her healing. I also felt it might help her move on with some of her chronic pelvic and spinal damage from early accidents. 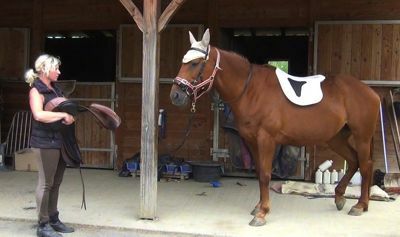 Using the technique of listening to her reactions to the threat, over a period of several months, she has come to the point of accepting the saddle without any negativity at all. She still dissociates at times, but even this is gradually melting away as she is able to stay with the process. Photo 1: Introducing the saddle blanket. By reading the signs from Hope i.e. retreating at any sign of anxiety, approaching when she relaxes again, in this photo I have reached her inner boundary. In the process of this horse trauma healing work I have found that knowing when to retreat and when to support comes down to personal intuition, practice and patience. One of the most difficult questions has been whether to retreat when the horse dissociates. I have been amazed by how conscious horses really are of every action I am making - even when they don’t seem to be giving you any attention - and patience has often brought a horse back into the present, but on the whole it seems to work well to continue while the horse is dissociated but to make the experience as positive as possible. In this photo I am scratching her wither and reassuring her. Although she is resting a leg and seems extremely laid back, her expression is not present. This is her way of managing her trauma brought on by the tacking up process. Photo 2: Hidden anxiety. When I attempted to put the saddle blanket on her back she went into a more immediate stress response and it is easy to see the fear in her eyes. At this point I back off to where it feels I am not threatening her and wait for her reaction. Photo 3: Removing the threat. When I am at a safe distance from her she dissociates again and in this case it feels right to stay where I am for a while. Her ears are not listening to me. Photo 4: Staying at her boundary. Patience paid off and relatively quickly she relaxes and comes into the present, yawning and licking and chewing in a relaxed way. 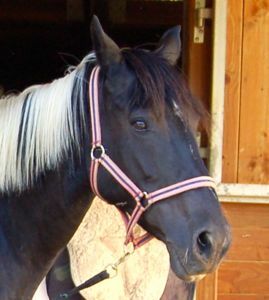 Interestingly licking and chewing can also be a stress response indicating horse trauma, if it is done in an anxious, rapid way. Her ears have come back to me and I can approach again. She accepted the blanket quite happily this time, staying present and responsive. Photo 6: Introducing the saddle. The same process with her ultimate fear: the saddle itself. Having made a good connection, she is content to dissociate again, but this state is deceptive. She is highly tuned to what I am doing and calmness and patience are crucial. Photo 7: Forming Good associations. Although I don't feel she is as present as she will be eventually, she showed no stress signs and her ears are more comfortable than in her initial dissociation. She stayed absolutely still to receive the saddle. Bearing in mind that she was a horse who tried to bite, kick and barge around at the approach of a saddle - and continued to behave like that for another two thirds of her lifetime after the original traumatisation - it shows that it is never too late, and horse trauma really can heal. This photo is wonderful because it shows Hope fully present, able to smell and truly acknowledge the girth. This is the first time she has been able to address her fears to this extent. If we have the opportunity to work with young horses who are still open and willing to give us their attention, it makes such a difference to take time with them, and to nurture and treasure their curiosity, personality, and their natural ‘being in the present’. It is this quality which makes us love horses after all.